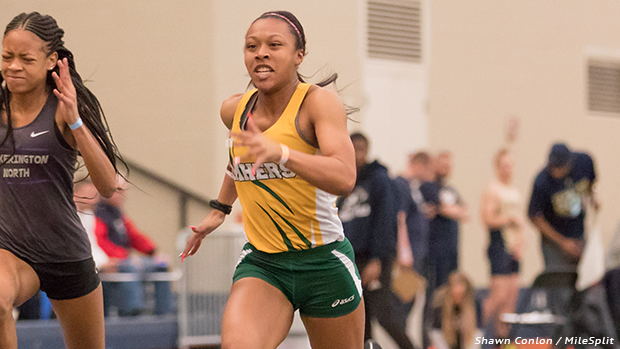 One of the state's top sprinters, Taylor Hooks is on the Amherst Steele roster. The 10th Annual ASICS Comet Clinic is scheduled for Saturday, March 16th at Amherst Steele High School beginning at 11:30 AM. FREE Track and Field Clinic for Coaches, Athletes and Parents! It is an honor to invite you to the FREE 10th Annual ASICS Comet Clinic on Saturday, March 16th, 2019 at Amherst Steele High School. In celebration of our 10th year, we are proud to provide an INCREDIBLE list of speakers and INCREDIBLE incentives for coaches, athletes and parents. Doors open at 11:30 am and the clinic will end around 4:00 pm. Our 10th year boasts over 20 clinicians that include Olympians, World Champions and National Champion Coaches and Athletes that will speak on over 45 topics. Topics include every event in track and field as well as injury prevention, plyometrics, yoga, nutrition, sports psychology and scholarship negotiation. 2) Athlete-specific sessions are designed to reinforce current coach instruction. Athlete sessions do not stress technique, but instead focus on event aspects such as: Mentality of a Champion, Performance Preparation/Analysis/Reflection, Consistency, Communication with Coaches and Teammates, Competing with a Purpose, Goal Setting, Event Strategy and Motivation. The underlying theme of ALL athlete sessions will be: Become a coachable athlete and trust your coach! 3) Parent - specific sessions are designed to provide advanced instruction on how PARENTS can best help their children reach their goals including sessions on Nutrition, Sports Psychology, Injury Prevention and Scholarship Negotiation. In addition to world-class speakers, attendees can enjoy team building activities, autograph sessions, a college recruiting fair and ASICS gear at deep discounts before the clinic and during the snack break. There will also be several raffles, drawings, contests, music, free food and drink. The day will end with a motivational address by our 2019 Keynote Speaker, 4x OHSAA State Champion, World Champion and 2011 Bowerman Award Winner - Jessica Beard!